“Prince William County plans to take a hard look at the Rural Crescent to see if the goals established when it was put into the county’s comprehensive land use plan in 1998 are being met. “Marty Nohe, (R-Coles) made the suggestion at the March 20 meeting of the county’s board of supervisors. The panel was holding public hearings on annual requests to initiate changes to its comprehensive plan. If initiated, a project would be studied by the county’s planning department, then have public hearings by the planning commission and board of supervisors. 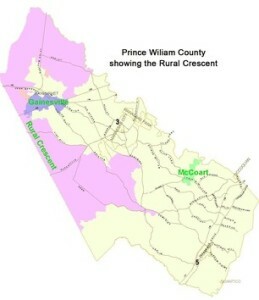 “In declining to initiate Mid-County Park and Estate Homes, Nohe observed this was not the first time someone had sought to change the boundaries of the 80,000-acre Rural Crescent. He said goals established when the area was set aside for large-acre residential development were to save agriculture and protect open space. He noted nearly 40 percent of the county’s agricultural land has disappeared since 1998. “Nohe added today’s goals for the Rural Crescent remain the same, but that other tools should be looked at to achieve those goals. ” ‘Are there other things that can be done to save agriculture and open space? What works in Haymarket may not work in Nokesville. We need to look at the bigger picture,’ he commented in proposing the entire rural area be studied. “Susan Roltsch, assistant county executive, said the county ‘needs to assess what’s happened since 1998,’ and agreed a broader study is called for. “Mid-County Park and Estates Homes in Coles District involved a comprehensive plan amendment (CPA) request by Classic Lakes, LLC, for about 306 acres along Classic Springs Drive. Mark Granville-Smith sought to change the land use designation from agricultural and estate (AE) and environmental resource (ER) to 129 acres of semi-rural residential (SRR) and 178 acres of parks and open space. “Supervisors also decided against initiating the Stone Haven CPA, a 337-acre tract on the northeast side of Linton Hall Road near the Rollins Ford Road intersection. The applicant wanted to change the long-range land use designation from flexible employment center (FEC) to 114 acres of suburban residential medium density (SRM), 189 acres of suburban residential low density (SRL) and 34 acres of general commercial (GC). “Staff documents show the Stone Haven CPA would cut county land available for employment uses by 6623 to 13,245 jobs and shift employment uses from a mix of industrial and office uses to mainly retail employment. “Wally Covington, (R-Brentsville), said he was ‘conflicted’ about the CPA, noting the project could include a high school and road improvements. He added Stone Haven also lacked community support. “The motion on Stone Haven was to not initiate the CPA and to do a planning study of the project area. Voting against the motion were Mike May, (R-Occoquan) and Frank Principi, (D-Woodbridge). “Supervisors agreed to initiate New Dominion Square on the Old Dominion Speedway site and the adjacent Bradley Square project, both in Coles District. Voting against initiation was Principi. “New Dominion Holdings, LLC, wants to change the long-range land use designation of about 41 acres on the east side of Dumfries Road from community employment center (CEC) and SRL to SRM. Owners of Bradley Square, the 22 acres adjacent to New Dominion Square, want to change the site from CEC to SRM. “Supervisors also decided not to initiate a CPA for the Bell property, a 127-acre tract on the north and west side of Catharpin Road in Gainesville Magisterial District. Owners wanted to change the long-range land use designation from SRR and ER to SRL and ER. The property is just north of Bull Run Middle School. May and Principi voted against the motion.